2011 World Championships: As usual I was reading my Zen Golf book, before the round, my book automatically scrolled to page 153, "how to make a flower blossom". The passage that stood out were: "Our nature is basic goodness, which includes the capacity for awareness and the impetus to learn and grow. Therefore, like a flower, we don't need to force ourselves to change, or try extra hard to learn and grow. It is our nature to do so". Followed by; "Negative self talk blocks the flow of confidence. Fear, anxiety, and self-doubt create tensions that block us from relaxing, and swinging freely". With that said here's what happened. Only 2 players were allowed to go to the final 9 in the Women's Masters division. I was in third place, 5 stokes back going into the final 27 holes, at the De Laviega course, this is a notoriously unfriendly lefty course, and knew from my practice round, would have to be picture perfect. All of the dangers were big fall offs on the right side of the fairways, which congratulated you with HUGE patches of poison oak, from which there was no official relief. Knowing what I had to do, I settled myself to throwing one shot at a time....sounds easy, but, thinking about the drive coming up, the ten foot putt you need to to hit, or just the fact that your shoe lace is untied can force you into a focus that you, and I, could not even believe was possible. I chose to play solid golf. One stroke at a time, giving total preparation, and intent with EVERY stroke. Going though all the signature holes, I thought of all the great golfers whose foot prints I was now walking. The feeling was overwhelming at times knowing I was on sacred ground, where it all began. I finally tied my competitor the 19th hole. Whew, worked hard for hours for that, only to find I would bogey on the 24th hole to put put me one stroke behind. Hole 27, the last hole, the signature hole, "Top of the World", one stroke from being where I wanted to be, in the final 9 of the Worlds. ( Check out my team mate, Nate Doss' description of the hole, on You Tube). My competitor, shot low and left. In practice I was about 2/3 of the way to the pin off the 300 foot cliff, with the pin sitting 585 feet, with ob 25 feet behind. I checked one last time at my notes which read, "bomb it at the telephone pole" with the BZSRG. * In my notes that means blue heavy weight Z Surge.*. The telephone pole is roughly 10 o'clock, the pin, 2 o'clock 300 feet at my feet. I trusted my notes and bombed it. I saw it catch some wind, get a little flat, and start that lefty hyzer. I couldn't see what was happening, but, hearing the claps from the ladies below, I realized it was inbounds. My competitor, was ob, and as I was walking up to where I thought I MAY be, I had to ask where the "blue" one went, they told me I was I was 23" feet BEHIND the pin,and had flirted with the ob more than once, wow, 600 ft throw off a cliff at the four hour and forty five minute mark in a round, to hit the shot I knew I could, PRICELESS! Being second in the world is okay when you find something within yourself that you knew you had, and, found a way to make it so solid, and so defined, if only to yourself. I am only writing this to inspire you to do the same when the chips are down. I went on to beat most of the open women scores in the final 9, and actually had a run at the finishing hole for par, which only my team mate, Paige Pierce, the World Champ had the opportunity to do so on that hole. I will continue to better myself, and all who will listen, about the importance of the mind game. Tips for better health: One of the single biggest things you can do to improve your game is to take care of yourself. At the very least, work on your core and flexibility. Benefits include: better distance with less effort, lowered chance of injury, because a well conditioned body can tolerate more demand, and when your body is used to being 'in repair', recovery time is lessened, and you are more prepared for the next day. Be active enjoy the results. There are many ways to improve core strength. One of my favorites is the exercise ball, a very inexpensive and effective piece of equipment. You can develop abs, chest, back, shoulders, and legs by following the instructions/tape provided in the package, or go online for more advanced exercises. Flexibility comes with it as a bonus. Gain even more, by stretching and yoga, and believe it or not, most cable companies have yoga 'on demand' 24/7, so trying to make a class is not an excuse. Bottom line, get moving keep moving, walk, run, hike, bike. Be active, and enjoy the results. Better health tip #2: Take a multivitamin everyday: Why? Why not? No one eats perfectly, and, some disc golfers rely on the nutrients extracted from fast food. Yeah, both of them: fat and empty calories. Garbage in, garbage out. That said, realize what you will be asking from your body the BEFORE you step on your first tee. Eat well the night before, good protein and carb mixtures to feed your muscles, and plenty of water to prevent dehydration. Not only in the summer, but remember, when you can see your breath on a cold day that's water too. Better health tip #3: Rest and fuel up: Although socializing is fun, having it interfere with your play is not. Be aware of your tee time, and know when to pack it up. Morning of the tourney, eat something for breakfast. Even a bagel with some peanut butter, a banana, or yogurt. Fill your water bottles, and don't forget to pack your course snacks, energy bars, dried fruit and nuts go a long way on some of these super long rounds. Water is the best medicine. Constantly drink it on the course. Those big orange containers are there for a reason, not decoration. When you are in a tough battle your breath tends to shorten, the shorter the breath, the more hydration lost. As you hydrate; not only is it easier on your muscles, but, it's also easier to control those touch shots you've been preparing for in practice. Although not a friend favorite, try to give your body a gentle 10 minute stretch AFTER your round. A very slow cool down lets your body know you are done for the round. Roll your neck, stretch your torso, give your legs a shake. Put your shoulders in a comfortable stretch, slow and steady. Give yourself a big hug, and be grateful for the things your body allowed you to accomplish...kick back and relax. Get ready for your next round, could be in an hour, could be next week, just know that you have done everything to prepare yourself and your body to perform at it's optimum level, and given yourself every possible opportunity to succeed. Improve Your Practice: Find a place where you can be alone. Not your home course. It's too easy to get sucked into a round with your buddies. Decide what you want to work on. If it's driving find a nice open field. Sometimes, you may find the key to that perfect anhyzer was not trying to horse that Z Predator, but putting pace and touch on an ESP Surge. Keep your mind open to throwing different models, and throw what works for YOU! Remind yourself during practice to throw different shots, big hyzers, flat punch drives, gliding annies, side arms, from the knee, against a tree. You never know when these thing will come in handy, but guaranteed, if you are not prepared it will take you out of your game. Repetitive motion = muscle memory, they go hand-in-hand. We ARE what we repeatedly do, excellence is not an act, or accident... it is a habit. Feed your brain: Understand why our minds say the things they say to us. Sport psychologists are not just for the rich and famous. My favorite book over the last two years is Zen Golf by Dr. Joseph Parent. I have read and re-read this book nearly ten times. Why? Because not everything is applicable at any one time. One chapter may stand out more in March, while another may make more sense for you in October. As you learn to apply different principals, you may change your ideas, reactions, and approach to the game we all love. You may find the toughest putting distance is actually the 6 inches between your ears. Always remember to warm up and stretch before a round. That said, newer players should be buying discs that are more suited for their skill levels. I see so many buying for looks, instead of their arm speed and abilities. Buying from your local Discraft pro instead of big chain stores gives you an advantage of having someone practically 'custom fit' discs for you. Plus, you get advice and tips on how to increase your consistency and lower your scores. Try not to get too attached to 'favorite discs.' Discraft has the most predictable plastic on the market. If you buy a Crush today, and another one in two months, it's the same. There is nothing worse than pitching one in the drink and agonizing over what to throw. So just grab another one, and go. Also, don't be afraid to talk to people at your course, get info online, and ask questions of your course pro. Yes, you can teach yourself how to play, but getting the correct discs and instruction saves frustration. Old habits -- especially bad ones -- are hard to break. Remember, we were all beginners too, and MOST disc golfers don't bite. You've just sunk your last putt of the season, you cashed, you're sitting back with your friends, there's a familiar crisp note to the air. Now what? Here are some tips on what to do during the "off season". Analyze previous season. Be honest; decide where you could have performed better, and what kept you from achieving your goals. . Take notes. I have notes on every course I have played since 96. I am finding, that more and more I am making notes to myself in the airport on the way home from a tourney while it's still fresh in my mind. Although the discs have changed, so have the way I see courses, and plan my shots, and I can see the progress that I have made over the years. It also helps later to visualize courses you may not have seen for a few years and help refresh your memory of tricky spots, bad shule, and birdies you should be making. Lay-off/don't lay-off? Only you can make that decision. Sometimes after a long season, it's just nice to sit back and relax. For others trying to stay "on top" of their game in the off-season is just the thing to mentally keep their game up. I find, being a hairstylist, that the holidays are just to hectic of a time, and stressing myself out by not getting my rounds in, is just not worth it. I enjoy being off all December, going to the gym getting my strength back up, outlining new directives for the next season and trying to plan what I am going to need to do to secure a great NEXT season.. While you are making your plans, did you suffer ay injuries last year? What do you need to do to rehab them? More stretching, getting exercise bands to improve your flexibility, working out harder for a more solid core, or just massage to loosen things up? Maybe, just revisiting Mark Ellis' putting clinic. Did you need to get some more distance? Is it body mechanics, poor follow through, lack of practice? Make a game plan. That may involve finding someone who is better than you, and see if they can see where you can improve that aspect of your game. Maybe you need to watch more, and throw less. Maybe you need to experiment with some of the newer model discs, you might have the disc in your bag, but, need to try it in a different plastic. Maybe you need to work on a new shot that could help you get out of tight places. There are lots of things you can ask yourself in the off-season, and, these are things you should be asking yourself if you are looking to make bigger advancements on the course next season. When your mind really starts answering these questions honestly, and openly, that's when you will see the dramatic advancement in you game you've been looking for. If you weren't looking to improve your game you wouldn't be reading this right now. Last, but certainly not least, try to relax on the course. Take in everything. You aren't going to make up lack of putting practice the day before the tourney, and if you've been holed up all winter and rusty it's gonna show. Take it in stride, make plans to prepare a little better next year, and remember to pull out those notes from the first tourney of this year when the snow starts falling and decide what you need to do for the next season. Confidence is a great thing; ignorant confidence is not. I NEVER, play a tourney playing courses blind. Some people I know can play great blind, but I do not. Even if I can only walk through it quickly, I take notes of "danger areas", and make myself aware of "best placement" opportunities. Well, this year, I, with my mountain girl confidence, and full of ignorance did just that. I was at the Tree Bash Open in Flagstaff. There were going to be 3 courses played, and when I got in on Friday morning I decided to play the two courses that were in town. The weather was nowhere near desirable and I figured that on top of the mountain, Snow Bowl would be much worse. Besides I played that course at the Worlds in '03, and still had my notes. A few people said that the course had changed since then, much shorter, and not playing as far up on the mountain as at the Worlds. I knew with my experience it would not be a problem. The schedule for the weekend was the 2 in town courses on Saturday and up the hill on Sunday. After the first two rounds I was hanging in there pretty well. Had a good nights sleep, and was ready to go on Sunday am. Tee times.. always a great bonus. Unless you have no chance to see many holes let alone play any. I practiced driving, and really felt ready to go when it was time to tee it up. Hole 1 was straight up the hill roughly 200 ft, with a 40 ft wide fairway. Most everyone birdied, I carded a 5, and realized then I had made a big mistake. The rest of the round had moments of greatness, and moments of pure disgust. I didn't even cash. So, in retrospect, I will always take the time to make sure to see the courses, so that I will always be prepared to play my best golf. Even if the score doesn't change much this year, at least I will know that I have done the best I can, to be prepared to play my best. Getting there a day earlier, will make MY life better even if it means another day of hotel and rental car that way I won't have to wait a year to make the corrections that should have been made during a solid practice round. Milford, MI An extremely tough, beautifully designed, physically demanding course. Has always been one of my favorite Worlds courses. Some of the uphill tugs can just be so humbling. La Mirada, CA A gorgeously laid out, perfectly marked heaven. Rolling hills, with strategically placed pins. AWESOME! Aspen, CO Everybody talks about it being the best setting... IT IS. If you go there and don't have a good time, you have a problem. Incredible scenery starts on the gondola and it only gets better when you hit hole #1. Love it. Fraser, CO Grandma Miller was a retired minister in her 70's when she obliged to let some golfers put the course in. 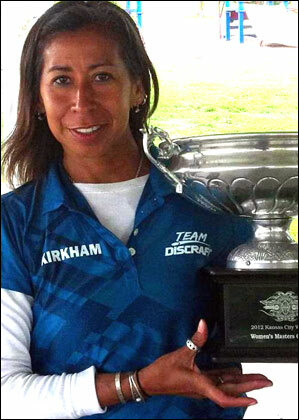 No one knew the impact she would make on disc golf. She always made time to meet new faces and greet old ones. She started tournaments with a special prayer, and always threw out the first disc. It never mattered whether you won or lost; the feeling and purity of the spirit is what really mattered. Course closed mid 90's. Waco, TX Two truly championship courses, back to back. Very challenging, with water, big hucks, great terrain small tight shots, and low punch drives. These courses have it all. All over From Austin, to Round Rock, Wimberly to San Saba. John never forgets to make every golfer think about distance and placement. When you finally get to putt, you're thankful you've made it down some of the most well planned fairways ever. Always a treat! Sheila is a proud lefty, but her bag is more unique due to the fact that her home course is at an elevation of one mile... that's more than 5000 feet! Discs tend to fly more overstable at higher elevations, so keep that in mind as you study what she throws. 174 gm After watching Paige Pierce and Catrina Allen throw these with such ease and accuracy, I decided that it is a fairway driver. I have been so pleased with this disc, it fits in smaller hands easily, and goes forever. It is amazing for tight shots in the woods that call for power, but, for a lefty, flat punch, its flight it is unsurpassed. 174 gm Picked this up at the 2012 Memorial, and was in test mode for about a round. This is one incredible disc. Very fast perfectly straight flight. I feel the smaller rim configuration helps increase power for smaller hands, and the Ti line of plastic is very easy to grip. Possibly be one of the best beginner drivers. Instantly a permanent addition to the bag. 173 gm This is what takes over when I am feeling the head wind is beefier than my Z Avengers can handle. I love the fact that I can still lay into it, and will finish beautifully and predictably. This the disc to throw off cliffs when you know that the elevation will accelerate the flight, but, you know you still need it fade back to the pin. Check out my experience at the 2011 Worlds with this disc, sometimes you can even surprise yourself. 174 gm Still working with this one. Can be a little beefy at high altitude, so, I started with a mid 60's, great disc at home...took it to low altitude, and realized it was a little understable. Since then have moved to a heavy weight, and definitely made a difference in its predictability. This disc has given me the biggest raw distance I have ever gotten. I will continue to keep working with it, because it flies fast, and far. Now that the Ti plastic has been released I am not only seeing this in bag now, but, also in my hand a little more often. 167 gm This disc is one of the reasons why I don't have as many X XL's in my bag anymore. Has all the great XL personality with the grippiness, stability and attitude that comes with the ESP plastic. A very nice addition to my bag. (174 gm) Mostly used for tight short heavily wooded holes, and low short punch drives, because of the durability of the Z plastic. Sometimes break it out for going over the tops of trees when I need a disc to fall forward and not hyzer at the end of its flight. Excellent beginner driver for juniors because of its ease to control at slower arm speeds. (max weight) Always a good tailwind driver. Great for uphill pumps at high altitude (6000+). I am using it more for longer approach shots, and shorter drives. It blends perfectly between the Buzzz and long drivers in light or no winds. Excellent choice for beginners. Not in my bag day-to-day, but is an absolute must in mountain courses. Holds the BEST anhyzer line at altitude (6000+) effortlessly. (167 - 173) Lower weight: used as flat flyer, or turnover with wind. Higher weight: still hyzers at the end of flight, and is faster than the Z XL. (169 gm) I never know when this disc is going to come into play, but, it's always nice to know it's there. I primarily use it for skip shots in the street, or, big lefty hyzers that have to go out over ob's, and come back hard to be safe. Love it for big spank shots in the woods, that require flat flight for about 150-200 feet with hard breaks at the end of flight. Also great for approaches when the wind whips up unexpectedly in the middle of a round. (168 gm) First run... yeah, it's old. I know what it's going to do: overstable and dependable. Jump on it, and there's always a hyzer at the end for me. I usually add a new one to my bag before a tourney in case I lose it, but I haven't yet. (168 gm) For those big Texas windy days, and, I have been there many times. Will handle high arm speeds and tough head winds beautifully. Always learning something every year, and this year, was, in Texas, just throw it in the bag...even on a calm morning, and don't get caught later guessing what's going to work when those 50 mph gusts show up. This disc will work for you, not against you. (174 gm) Never in my bag on a day-to-day basis, but always great to look down and see it hanging out there waiting its turn to show its power. I will usually put this in my bag when I am feeling the wind in practice. Totally indispensable in medium wind conditions. Keep your chin up, throw your shot and watch it go...never ceases to amaze me. (174 gm) Flies great in the wind: flat with a small predictable hyzer, and barely a skip. Perfect for narrow fairways, especially where shule is all around the basket. Helps me in warmer months by reminding me to keep my form smooth and flexible, just like the plastic. (174 gm) Total go to disc. Unparalleled flat flyer. I always keep one that is extra beat up for hyzer pops, one mildly beat for floating turnovers, one just broken in for flat flight, and another for when I need it to come back, just a little at the end of its flight. Sometimes will throw a brand new one in the bag before a round just in case. Yep, that's right 4-5 total, this disc has been one of the easiest larger rimmed discs on the market to throw. The X plastic keeps it comfortable in the hand on cold days, and is much easier to keep dry in rainy conditions. I don't throw it in stiff head wind conditions, at lower altitudes, but, you can't beat the glide with a tail wind. (168 gm) Still throwing the same two that Discraft sent me when they first came out. So much more reliable in windier conditions than the X, but I can throw it with more intent knowing that it will get stable at the end of its flight. I always have a brand new heavy weight back up in the bag, just in case, but this disc has been SO predictable I rarely have to pull out the new ones. Added bonus, the Z plastic is so resilient, it takes a beating and keeps its performance levels high. (max weight) Especially useful in higher wind conditions. More overstable (hyzer) than my Z, so I can count on it to hyzer at the end of its flight even if I jump on it. (174 gm) All the characteristic of the X Avenger, with less stability. This disc is a notorious winner in so many aspects of the lefty game. Flat, flip, pace. I have yet to see a driver anywhere with the smooth gentle glide that easily maintains anhyzer lines without a huge skip on arrival. This has been one of my favorite drivers through the winter, because the ESP plastic is so much kinder on cold fingers. (max weight) All purpose approach, and accurate short tee shots. Hyzer, flat, or anhyzer, give this disc a line and it responds with going exactly where you intended. It has been in my bag since the first time I threw it. Not above putting with it in super heavy wind conditions. So totally indispensable I always carry 2, one beat, one fairly new. (max weight) For all the same reasons I carry the X Buzzz, just a little more overstable when the wind kicks up a bit, or just feeling some nerves. Yes, even pros get a little jittery from time to time. (174 gm) I always carry 2 putters. Stiff rimmed, with softer centers. My main putter is for putting only, the back up for shorter approaches, or putting when the breeze is coming up a little. Both are reliable to putt with, and, I have never had any other brand of putter in my bag. (174 gm) Mostly used for longer approach shots because I can put more speed on it, and not have to worry about it turning over. Kind of a tank, but I can always count on it to finish with a hyzer.